Not showing the correct available slots. Worked great for the last month. Now shows the original available slots. Many submissions on this form. 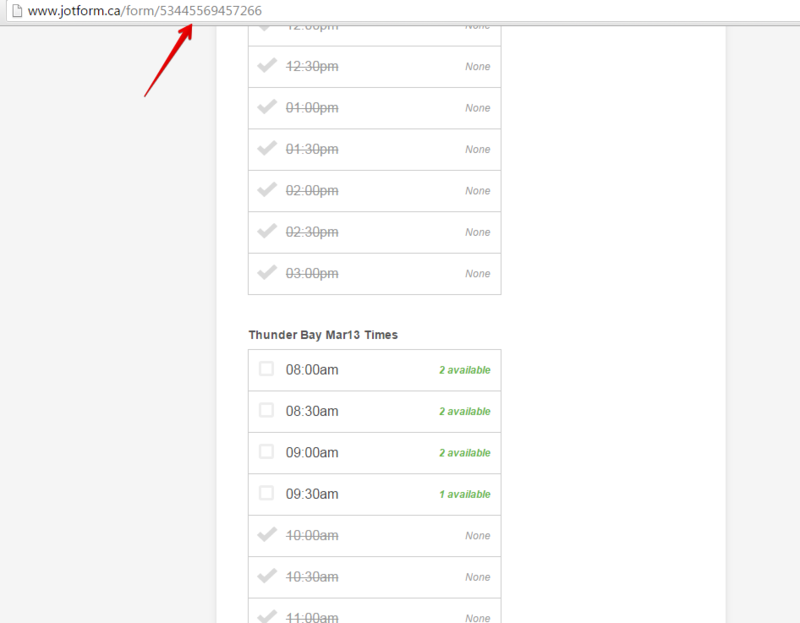 Most time slots should show unavailable. Across all forms. No modifications on most for past week or two. I checked your jotform http://www.jotform.ca/form/53445569457266 and I can see the Appointment Slots widget showing available slots and unavailable slots. I am not sure yet which of them are incorrect. Can you please indicate which slot have incorrect value? We will check further once we know the needed data. On another note, we did have temporary issue with our API late yesterday (but was fixed immediately) which could have caused the issue on this. Perhaps you just need to refresh the form by loading it on your Form Builder, open the Appointment Slot widget and update. Then, Save the form. All Ok now... Last night all forms showed available. Many devices, locations, cleared cache.